The FuturEnergy AirForceTM 1 and AirforceTM 10 wind turbines are ideally suited to battery charging, water or space heating, local off-grid network or grid tied applications. All conversion and control systems and accessories are available to make installation and commissioning trouble-free. Remote access and control software and automatic stop units provide peace-of-mind operation in all wind conditions. The AirForceTM 1 horizontal-axis upwind turbine incorporates the FuturEnergy in-house designed and manufactured permanent magnet generator as standard, providing efficient and reliable electrical production. Weighing only 19kg, our 1kW turbines are tower-top ready. Instructions are supplied that safely guide you through the simple self-assembly and installation. 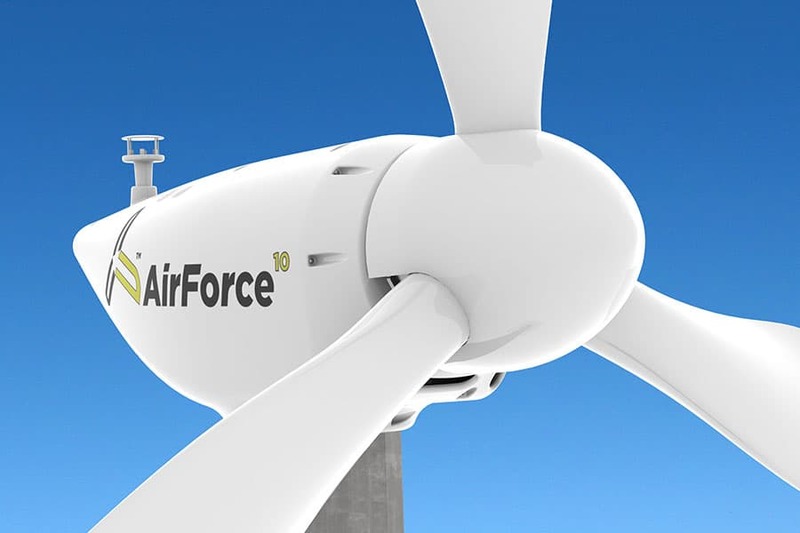 The AirForceTM 10 is a state-of-the-art 10kW horizontal-axis upwind turbine with active yaw that incorporates a range of operational and safety features that are unique to turbines of this size. The number of components at the mast-head have been minimised, reducing the complexity, maintenance requirements and cost, while improving reliability, performance and safety. Fully automated shut-down systems with remote monitoring and control capability ensure owners satisfaction. In the FuturEnergy online shop you will find a complete range of turbines and accessories. 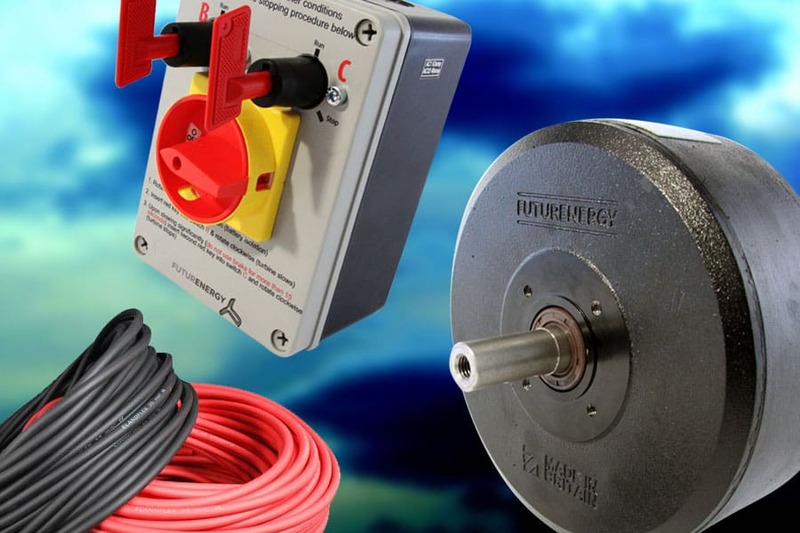 Products include the complete AirForce1 wind turbine, tower kit, a range of permanent magnet generators, stop-switches, charge controllers, resistors, blade sets, immersion heaters and high-power cables. 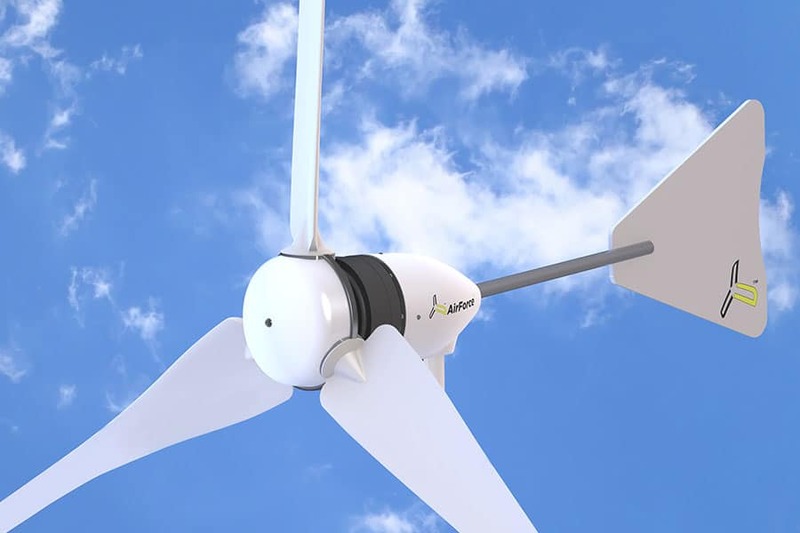 FuturEnergy’s AirForceTM 1 wind turbine was introduced to the market in 2006 with more than 6000 turbines sold world-wide. Successful micro-generation installations range from farms and small rural businesses, to Arctic exploration vessels, private boats, rural retreats, caravan parks and off-grid telecoms sites. FuturEnergy is recognised as a leading UK wind turbine manufacturer and continues to invest in research and development, recently introducing new bespoke permanent magnet generators to the AirForceTM 1 and AirForceTM 10 range. A continuous improvement policy ensures that the specification and performance of our wind turbines is progressively enhanced. An enviable reputation for delivery of turbines demonstrating robust construction with rigorous quality standards, low noise emission and optimum performance has been established. Today, FuturEnergy offers a 1kW wind turbine in 24V and 48V versions suitable for battery charging, water/air heating or local grid network, with a High-Voltage version ideal for grid-tied installations. The 10kW turbine is in the final stage of development and undergoing exhaustive trials. Sales are carried out directly and via a global network of distributors. As a leading manufacturer involved in extensive research and one of the UK’s leading wind turbine suppliers, FuturEnergy offers objective and expert advice on key issues to anyone considering investment in wind technology and domestic wind turbines such as return on investment, location and integration with additional renewable technologies.